INFO. I am an artist and I live in Halifax, West Yorkshire. My paintings are exhibited regularly at a number of galleries and venues across West Yorkshire. Moreover, my artwork has been selected for collections in UK, Europe, USA, Australia and New Zealand. In addition to original works of art, I also offer premium signed prints and greeting cards in different sizes. These are available through this website. I have had a passion for art since I was a child. Currently, I work from my studio in Halifax. Also, I have trained with some of the leading national and internationally known artists, who have influenced the development of my own personal style. I think it is important for an artist to keep learning and refreshing ideas. It is an exciting journey. Especially, I am fascinated at the play of light and color that completely changes the appearance of the environment, its people and wildlife. So many great artists have tried to capture the fascination of light in their work. Hence, I believe it is one of the most exciting aspects of any painting. 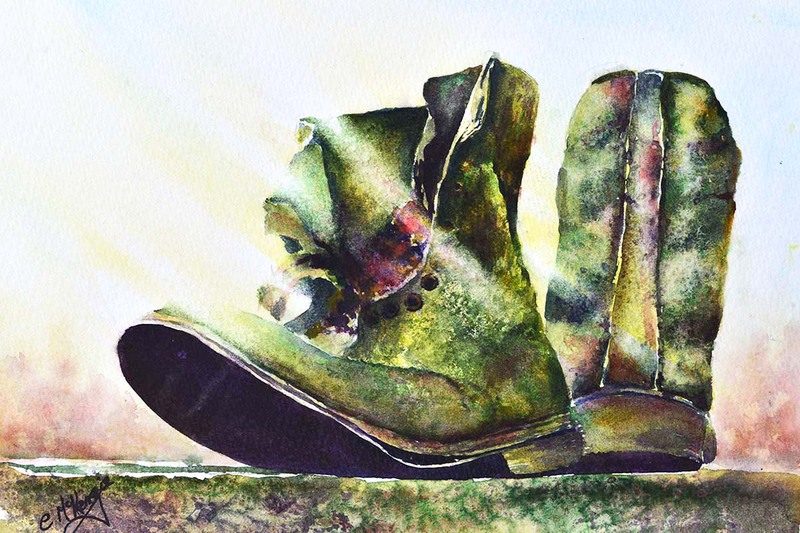 Consequently, I am constantly striving to reflect the impact of light and color into my own work.Old boots.